Compared with X-3 / X-6, X-3H / X-6H airless sprayer is with Durable High Cart for great portability. X-3H & X-6H High cart airless sprayer is the Ideal option for DIY homeowners and handymen spraying low to medium coatings to take any interior project, exterior houses, fences and decks. The convenient cart makes exterior painting easier allowing you to roll the paint and sprayer around the job site. • Full set include: airless sprayer machine, airless spray gun with #517 tip, 7.5m (25ft) hose, 30cm extension pole(X-3H not including) , manual. * with TUV CE Approval. * PATENTED OILLESS DESIGN, WORLD FIRST DESIGN TO LUBRICATE THE PISTON ROD AUTOMATICALLY, SO LET THE USER DOESN’T NEED TO ADD LUBRICATING OIL EVERY DAY. 1.Convenient cart – easily move sprayer around on the job. 2. Adjustable pressure, easy pressure control with User-friendly symbols for simple selection of operating modes from low pressure cleaning, medium pressure controlling and high pressure airless painting. 3. Flexible suction tube – spray directly from 1 or 5 gallon containers for small or large projects. 4. Paint saver pail hook – effortlessly move 5 gallon paint container with cart. 5. 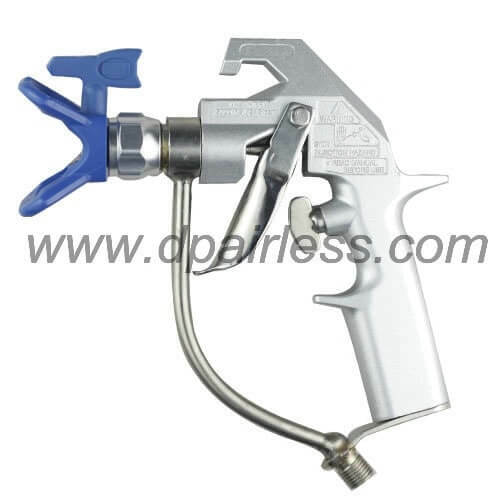 X-450 Airless spray gun, forged aluminium gun for exceptional durability. 7. Clean filter system provides added filtration to reduce tip clogging and self-cleaning. 8. Patented lifetime lubricated piston rod, maintenance-free operation, world 1st designed by our own engineer team. 9. Patented internal bearing system by our own engineer team. 10. Exceptional durability, long life and dependable performance. 11. Modular components for easy servicing, the piston rod, O-ring, gasket, etc. could be replaced which saves the overall maintenance cost. do you have distributor in ISRAEL now? we want to buy this sprayer for the paint indoor and roofing, how’s the performance? what’s the minimum quantity to ship from China?